The job: Sort food and check expiration dates. Set up food on tables for assembly line packing. Help assemble donated food into sacks. Perfect for all ages but especially grade school children with parent. Goal: Sort food & assemble 600+ Pantry/Power Packs on Saturday, May 18. Pantry Packs and Power Packs are programs in which students, identified as being "food insecure" receive small packs of food to take home on the weekends or long breaks. 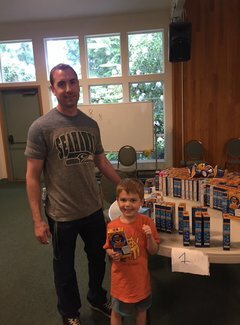 Packs and food will be distributed to Lake Washington School Disctrict, Riverview School District and Issaquah School District. Select Sign Up button below. After packs are assembled, deliver a carload to Novelty Hill area home. Volunteer may come early and help with packing, but not required.